The staff:child ratio changes ignore the competing demands on staff particularly from children with emotional needs and the new two-year-old intake, says Pat Gordon-Smith. It's 9.40 on a warm April morning, the first of the year. Almost everyone in the south London nursery school I'm visiting is outside, but a few children remain indoors, where a group of threeand four-year-olds are peering into a fish tank full of frogspawn and talking keenly to Frances, the practitioner seated with them. There is great purpose in the children's chat, but that's not what is most striking. It is the sight of Bella, a three-year-old who began to howl when her mum left the room and who is now seated on Frances's lap, embraced but still sobbing, part of the group but not. Frances rocks Bella and talks to her gently, offering soothing words and including her in the frogspawn chat. It is a skilful balance of care for personal need with talk about nature, involving layers of experience for all the children, from observation of pond life, through the frustration and benefit of hearing other people's ideas, to the effect of being held when you are sad. This potential loss of the capacity to care for children as they need it is of great concern to the people who work with them. It is a sign that practitioner qualifications and adult:child ratios cannot be isolated from other areas of policy, in this case the new entitlement to free provision for two-year-olds in deprived areas. The effect of just this policy on staff relationships with children and on their own capacities is significant, as indicated by Toni Evans's mixed evaluation of its impact on Lincoln Hall, for while she welcomes the deeper relationships enabled by children arriving younger and staying longer, she says it is offset by significant additional pressure for staff. Julie Picken has a particular concern for heightened emotions because many of the children attending Sugarbrook Pre-school live in poverty and most have additional needs. Staff and children are supported by regular visits from expert teams but she is insistent on the need for constant, intentional nurturing from staff. Back at the south-London nursery school, manager Philip sits in the sunshine. 'It's different, isn't it? Calm.' He indicates that the space around him is remarkably empty of children. 'Not so long ago, we'd have been like this by the end of October, but settling all those three-year-olds in September and January takes such a long time now.' He is referring to the impact of yet another government policy: the single point of entry to primary schooling in September. The stress created by this shift towards more younger children who stay for a shorter period has been apparent in the six months I have been observing the setting as part of research into children's experiences around difficult feelings and behaviour at nursery. On this April morning, Bella is the only child out of 60 who is crying at the beginning of the day. All the others appear busy in pairs, groups, by themselves or with an adult. It may not stay that way, but the relative calm that enabled Frances to balance care for Bella so deftly with frogspawn chat is a far cry from the general noise and need of children that pervaded the setting when I first noticed Bella in January. On that day, Bella, who was new to the nursery, involved me in her day when she appeared at my side and asked so insistently for her mum that I took her hand to find some knowledgeable care. Practitioner Yvette appeared free, and Bella put her arms out to be picked up. But Yvette could not pick her up or help at all because she needed to change a child who had just wet himself and was also suddenly inundated by three other children: one seeking help to resolve a dispute and two others with drawings to show. Meanwhile, the noise of children inside on a cold day made it hard to hear anything at all. Seeming torn by the competing demands, Yvette took Bella's hand and led her to Martha, who embraced her immediately, but all too briefly because, moments later, she was called upon to get a cold compress. Bella has since grown in confidence and is now usually seen involved in play by herself or with others, once the morning distress has passed. But she spent the rest of that January morning either holding a practitioner's hand, holding my hand, looking around or reaching out. She appeared completely unready to cope, and relaxed only when Yvette was able to pick her up for short periods. When More Great Childcare was published a week later, it was Bella's palpable distress and the too-many calls on Yvette and Martha that sprung to mind amid the talk of reduced costs and better pay. Also in mind were other observations of staff working to support individuals amid competing demands: Philip drawing his little shadow Daryl into a group of sometimes too-confident boys by letting them all sit, peer over or lean against him as he read from a storybook; teacher Ali celebrating when her own shadow, Maddy, finally set off to investigate the nursery with Ali's suggested magnifying glass in hand; Frances taking distressed child after distressed child from anxious parents and offering them hugs while other adults answered the calls of her more confident key children. Of course, for every insecure child during this time, there were ten others playing and with no apparent need for help. After all, my research centres on the children who are not coping so they are the ones I tend to observe. Even so, Frances confirms Philip's view that the single point of entry to primary school has made things difficult for everyone. 'If we had more experienced four-year-olds to show new children the way, it would be so much easier to help them feel confident,' she says. Given that, it's tempting to wonder how much easier it might be if there were also experienced five-year-olds to help out, as there are in the French ecoles maternelles whose calm was recently praised by childcare minister Elizabeth Truss. It is a warning, perhaps, and one that policymakers would do well to heed. 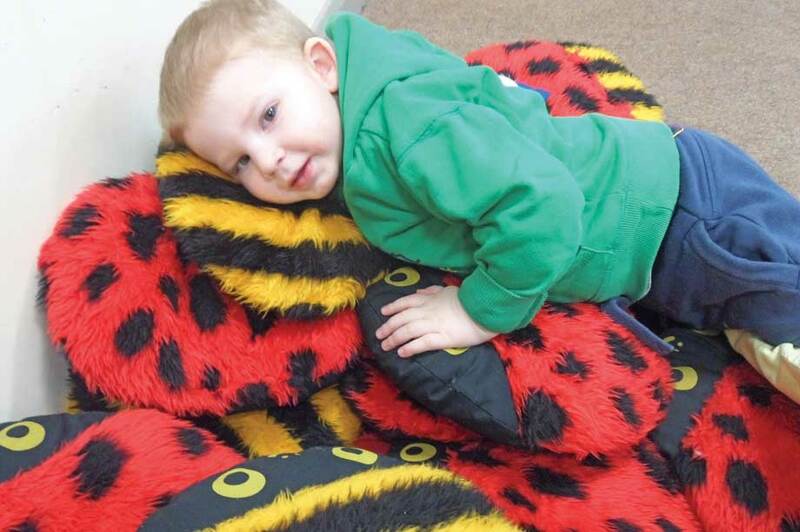 Every nursery space offers challenges for ensuring children's safety, and flexible staffing is often required. 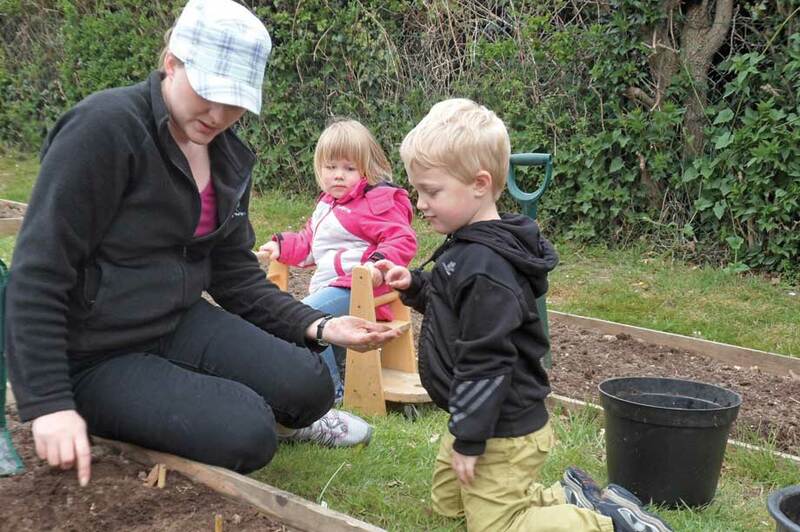 Little Oaks Day Nursery in Holt has the significant benefit of a huge outdoor space with two large gardens. On its fullest days, there are 26 children age two to four in the nursery and it is easy to deploy the five staff so that no one adult is supervising too many children either indoors or in either garden. But, says manager Emma Maloney, things are not so easy on days when the number of children require only three staff. One garden must remain closed so that two adults can be available in the remaining garden, and even more juggling is required if a two-year-old has a toileting accident. In that case, says Ms Maloney, 'one member of staff will have to go to the bathroom with that child, leaving only one adult outside and one inside'. This creates a need for staff flexibility. 'The children have free access to the outdoors in accordance with the EYFS', she explains, 'but if too many go outside or come inside during a toileting event, all the others may have to follow to ensure a safe ratio.' And even when all three members of staff are available, she says, 'there are times when a member of staff may have to stand with one foot indoors and one foot out, to ensure the correct supervision of both spaces'. Given the existing challenges for supervision, Ms Maloney does not believe that the nursery could operate well and safely on tighter ratios. And, while the creative supervision arrangements at Little Oaks are specific to its needs, every nursery space in England's overwhelmingly non-state provision will throw up problems for supervision, be it an L-shaped room or a flight of stairs or a set of double doors. Tighter ratios, it seems, could make many spaces to supervise well.